Luciano Prisco – New Works, Poems from Christopher Barnett: Mark Roberts on Christopher Barnett, Poetry and Collaboration. 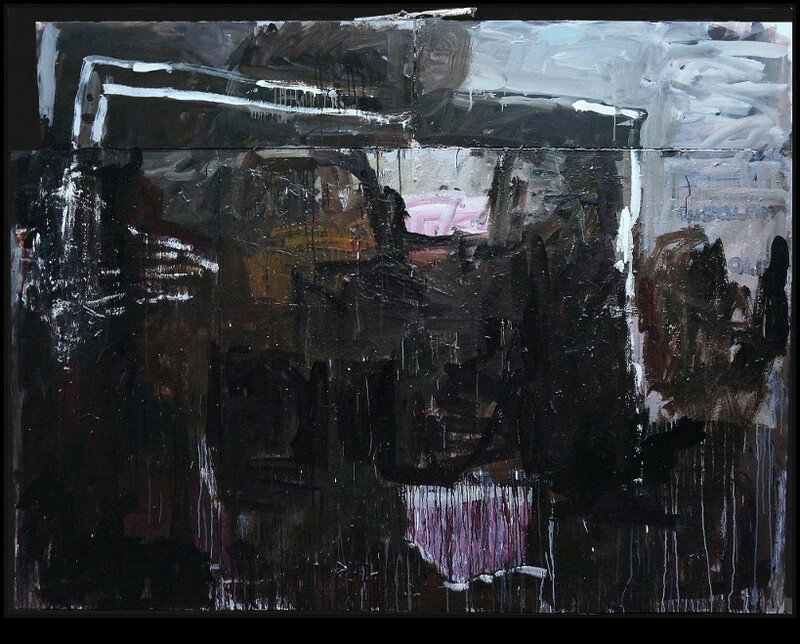 Luciano Prisco – New Works, Poems from Christopher Barnett opened at the Langford 120 Gallery (120 Langford Street North Melbourne Victoria 3051) on 10 September and runs until 9 October 2016. Luciano Prisco’s latest exhibition at the Langford 120 Gallery in Melbourne is a collaboration between the Port Phillip based painter Prisco and the Nantes (France) based writer Barnett. Mark Roberts, who has followed Barnett’s writing since the mid 1980’s, provided the following introduction to his work for the exhibition. ulrike meinhof sings was collected, along with two other extraordinary works, th last days of the world and basket weaving for amateurs in a collection by the important Melbourne based publisher Rigmarole in 1984 (Last Days of th World and other texts for theatre, Rigamore Press 1984). Together with the earlier works, A Fist in th Face of Public Taste (E.A.F 1978) and Selling Oursleves for Dinner (All Out Ensemble 1982), these works represent something unique and rare in Australian theatre and writing. At the time I sensed something of the “ultimate commitment” that Michael Dransfield referred to. A commitment to words, to their meaning and power, their pace and rhythm. If Barnett’s work didn’t make you angry, didn’t make you want to take to the streets then you were obviously on the wrong side of history – or that was how I saw it 30 years ago. Recently I have increasingly found myself drawn back to basket weaving for amateurs. This text attacks the complacency of Australian culture and cultural criticism and takes the form of a series of voices, artists Margaret Preston and Thea Proctor and a number of critics such as Lionel Lindsay, Sydney Ure Smith, Bernard Hall, Humphrey McQueen, Max Harris and Kym Bonython as well as the generic voice of the “art critic” which functions almost like a reactionary Greek Chorus holding back art and protecting the status quo. It is difficult not to read this and not think of the way Australian culture has developed since Barnett wrote these words. The flagship companies and galleries are seen in terms of economic multipliers, grass root artists have been cut loose, made to scramble for crumbs and scraps. Revolution may not be the current aesthetic but if this country is to have a cultural future it may become an imperative. Looking back on it now this poem is at least the equal of the best work published in Australia over the last 50 years and confirms for me Barnett’s position as one of our most important poet/writers. It is possible to see basket weaving for amateurs as an farewell to Australia for in 1993 Barnett left Australia for France never to return. The almost a quarter of century Barnett has lived and worked in France could be seen as a kind of self imposed exile but that assumes that he wants to return to Australia. I sense that Barnett has found a level of acceptance for his work in France that would be impossible in Australia and that the political and cultural changes that have taken place here since 1993 has made a return less and less likely as the years have passed. In France Barnett established an experimental theatre company, Le Dernier Spectateur, in Nantes. Working collaboratively with the marginalized and disenfranchised, Barnett, used poetry, dance and music to help empower people and has attracted praise and support from all levels of French society. In parallel with his work Le Dernier Spectateur Barnett has continued to write and the evolution of social media over the past decade has provided him a new platform for his work. Indeed, like many others, it was through his Facebook posts that I reconnected with Christopher a number of years ago. What I quickly realised, however, was that social media was another medium for Barnett – like the written page or the stage. It was a form of poetic pirate radio. Among those poems that I read on Facebook were sections of what was to become when they came/for you elegies/ of resistance (Wakefield Press 2013). This extraordinary work, at once a elegy for Furkan Dogan, the young Turkish activist assassinated by the Israeli military during an attempt to break the blockade of Gaza, and a memoir of Barnett’s own engagement with his own political and personal struggles. when they came/for you elegies/ of resistance is a dense work, for most of the 316 pages the poem runs in two columns down the page and the reader is propelled forward, taken by the rhythm of the words, the patterns, a machine gun scattering of words. But this is also a work that keeps pulling you back in, where you keep discovering new meanings, new references – for me it was also an education, the text has sent me off in numerous directions over the past three years – learning, discovering. There is an immediate connection here between Barnett’s words and Prisco’s dark painting. 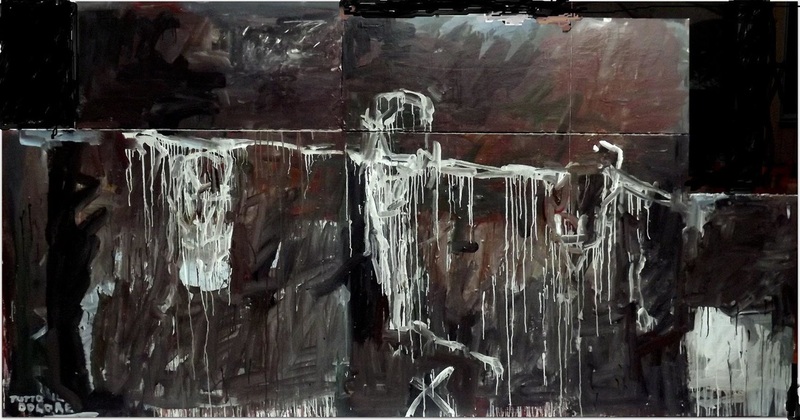 The angular edges outlined in white, the thick browns, greys and black, the thin lines of white dripping through the painting and the surprise of maroon – are reflected back in the poem in lines such as “sound from blood….”, “streaming from skin” and “walk/off world’s/edge”. Barnett has never conformed to the image of the solitary writer – he has always been collaborating – from his theatre texts in Australia, to his work with Le Dernier Spectateur and his poetry. Once again with this exhibition his words act as mirror for the images, reflecting and amplifying an intensity – while, at the same time the paintings are doing exactly the same with his words. Mark Roberts is a Sydney based writer and critic. His latest collection of poetry, Concrete Flamingos, was published by Island Press earlier this year. He is the founding editor of Rochford Street Review.